Theros, the latest Magic: The Gathering set from the folks at Wizards of the Coast is now available. This new set, which takes place on Theros, a plane where gods, heroes, and monsters are an everyday fact of life, released on September 27, features 249 black-bordered cards. Theros seems to have a strong enchantment theme, using a combination of enchantment creatures and artifact cards. 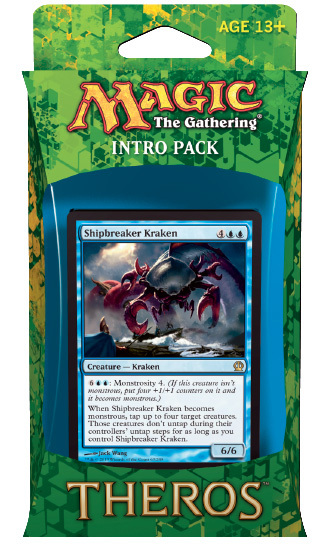 As usual, the new M:TG set is available in a couple of different sizes and options: to help you get started there’s the intro pack, which includes a 60-card ready-to-play deck, a premium foil card, two sealed 15-card booster packs, a strategy insert, and a how-to-play guide; there standard 15-card booster packs; and for those who want a lot of bang for their buck there are the fat packs, which is essentially a box of sealed 15-card booster packs. Theros set is separated into 5 different intro packs: Favors from Nyx, Manipulative Monstrosities, Devotion to Darkness, Blazing Beasts of Myth, and Anthousa’s Army. 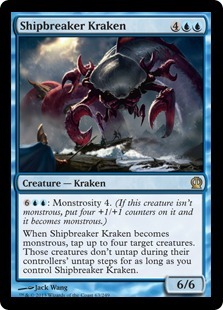 Each deck has a unique advantages of the others, unique cast of monsters, spell cards, and lands combinations. The set that was sent to us for review was the Manipulative Monstrosities, which gives you the benefit gargantuan aggressors, including Captain Jack Sparrow’s favorite beastie, the Kraken, and destructive forces of nature, like lightning strikes, volcanic geysers, “griptides,” magma jets, and the good old-fashioned Sea God’s Revenge. You probably don’t want to piss that guy off if you’re in a boat. Amongst this set, my favorite title cards – based on name alone — were the Curse of the Swine and the Ill-Tempered Cyclops. But can we be honest, do we really want our cyclopses (cyclospi?) any other way? Mild-mannered or easy-going — no thank you! Of Theros’ 249 cards, 60 of the card are considered uncommon, 53 are rare, and 15 of them are mythic rares. A few of the mytic rare cards incude 5 God cards: Heliod, God of the Sun, Thassa, God of the Sea, Erebos, God of the Dead, Purphoros, God of the Forge, Nylea, God of the Hunt. As always, each card is beautifully (or horrifically) illustrated by a different artist, with their own unique style. I honestly had a hard time keeping these cards away from my 4 and 6-year-old boys, who loved looking at the cards and coming up with their own adventures and battles. Theros is the 62nd expansion (wow!) for Magic: The Gathering, and is an easy recommendation for MTG enthusiasts.